Abstract. High-resolution time-lapse ground-penetrating radar (GPR) observations of advancing and retreating water tables can yield a wealth of information about near-surface water content dynamics. 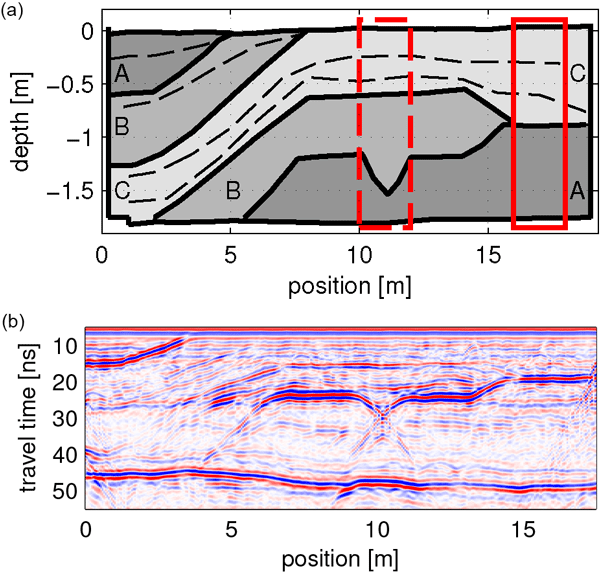 In this study, we present and analyze a series of imbibition, drainage and infiltration experiments that have been carried out at our artificial ASSESS test site and observed with surface-based GPR. The test site features a complicated but known subsurface architecture constructed with three different kinds of sand. It allows the study of soil water dynamics with GPR under a wide range of different conditions. Here, we assess in particular (i) the feasibility of monitoring the dynamic shape of the capillary fringe reflection and (ii) the relative precision of monitoring soil water dynamics averaged over the whole vertical extent by evaluating the bottom reflection. 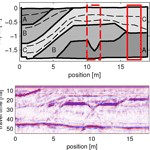 The phenomenology of the GPR response of a dynamically changing capillary fringe is developed from a soil physical point of view. We then explain experimentally observed phenomena based on numerical simulations of both the water content dynamics and the expected GPR response. How to cite: Klenk, P., Jaumann, S., and Roth, K.: Quantitative high-resolution observations of soil water dynamics in a complicated architecture using time-lapse ground-penetrating radar, Hydrol. Earth Syst. Sci., 19, 1125-1139, https://doi.org/10.5194/hess-19-1125-2015, 2015.